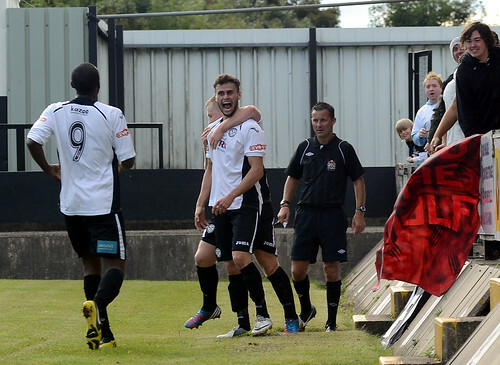 Hednesford Town’s dreams of an FA Cup run into the Fourth Qualifying Round were temporarily put on hold after Rob Smith’s team threw away a two goal advantage as Buxton showed impressive character to battle back in the second half and force a replay. The away side, having won their last three matches, dominated possession in the opening exchanges but showed little sign of causing Dan Crane in the Hednesford goal any trouble save for a header well over the bar by Istead on fifteen minutes. 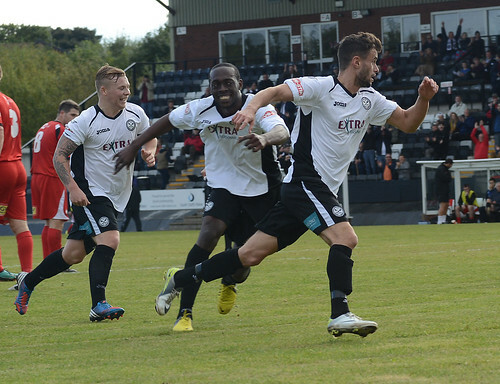 It was The Pitmen who took the lead on the half hour mark with their first shot on target as Dave MacPherson stroked in a loose ball after Neil Harvey and Aaron Rey had held the ball up inside the penalty area. Nathan Woolfe, so impressive in a Hednesford shirt this season, added a second six minutes later with an outstanding left foot curler into the top corner. Neil Harvey was sent away down the left channel from a long ball by Jamey Osborne, the striker laid the ball off to Elliott Durrell who left it for Woolfe to finish with real class. The game looked relatively comfortable for The Pitmen at half time but the Keys Park outfit weren’t able to contain Buxton in the second half and the away side stormed back. 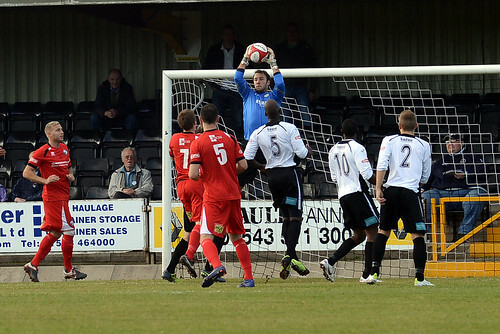 The Pitmen will curse their luck however as, when the score was still at two-nil, Durrell first snatched at a loose ball in the area and ballooned his shot over the bar and then terrorised the Buxton defence only to see his shot hit the cross bar, bounce down on the line and both Woolfe and MacPherson were unable to scramble in the rebound. The home crowd felt their side were on the end of some perplexing refereeing decisions before Kyle Nix hit a brilliant free kick into the corner from twenty yards out to reduce the deficit on fifty-nine minutes and, with Buxton’s tails up, it was always a worry that the second goal would come. 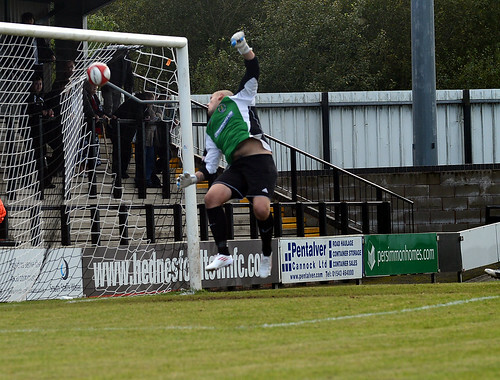 Mark Reed caused Pitmen hopes to sag as he headed in a cross on seventy minutes to equalise for Buxton but it was Durrell again who was thwarted by sharp goalkeeping in the final minute as the scores stayed level. The replay will take place on Wednesday night, KO 7.45pm, in the heart of the Derbyshire Dales. The match will no doubt have the earmarks of a highly pressurised game with the FA Cup dreams of both sets of supporters at stake. The importance of the game could take on even more significance if, on Monday, a big team is drawn out to play the winner of this replay. Pitmen fans will no doubt travel in number and be hoping, even dreaming, of a victory and big name in the Fourth Round draw.